Do You Think All Toothbrushes Are The Same? Most people believe that a toothbrush is a toothbrush and that there really is no difference between them. Unfortunately many people also underestimate the importance of good oral hygiene and the critical role it plays in your overall health. This is particularly true during orthodontic treatment. Honig Orthodontics in Newark and Middletown DE is setting the record straight. All toothbrushes are NOT alike. First of all a child’s toothbrush should be small enough for it to fit comfortably in their hand so they will be more likely to actually use it. The head of that same children’s toothbrush should have soft bristles and be small enough to fit smaller mouths with smaller teeth so as not to damage sensitive, still growing gum lines. The same advice goes for adults as well. Some adults believe that a very firm bristle will assist in getting their teeth cleaner when in fact a toothbrush that has too firm bristles can cause damage to the gums and gum tissue. There are all types of toothbrushes. There are curved handles, straight handles, no slip solid grip toothbrushes and some with different colored bristles to warn you when it is time to replace it for a new one. 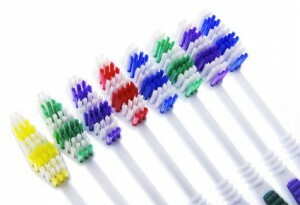 Whatever works best for you should be your choice preference in purchasing new toothbrushes. However, remember that it is the bristles that contact both the teeth and gum line and therefore care must be taken so you don’t do more harm than good. You should also make sure that your choice is accepted by the American Dental Association. No matter what toothbrush you choose you should also remember that flossing is a key part of oral health and hygiene and should be done at least once per day but preferably more. So, be smart and contact Honig Orthodontics and ask what type of toothbrush is best for you and your children or to schedule a complimentary orthodontic evaluation. You will be glad you did.